I want to use latest ffmpeg to encode set of JPG frames to 1920x1080 60fps h.264 movie. I'm looking for set of parameters that will allow smooth playback of encoded video on fairly strong PC machines like I5-3570@3.4GHZ+Intel HD Graphics. But when I play output.mp4 in latest VLC or WMP I got framedrops (not many, but noticeable). I played random youtube 60fps/1080 material on the same machine and the playback was smooth, so I assume that the machine is capable of smooth playback but the video has to be encoded with appropriate parameters. What parameters could be used to make the decoding less processing power demanding? I would like to maintain full hd quality and 60fps, but the file size is not relevant. After testing various options of GOP (-g), reference frames (-refs), buffer sizes (-bufsize), bframes (-bf), disabling cabac (-coder 0), profiles (main, high, high10, high422, high444), levels (3.0 - 5.0) and testing various players enabling/disabling hardware acceleration I come to conclusion that it is probably not possible to encode sharp H.264 1920x1080@60fps with game-like dynamics so it would be playable on typical PC flawlesly. I tested various machines including Mac Book Pro. The only machine that was able to play the material smoothly was the latest Samsung TV model (UHD series). In VLC, while playing back the video, go to Tools menu > Media Information. On the Statistics tab, are any frames dropped? 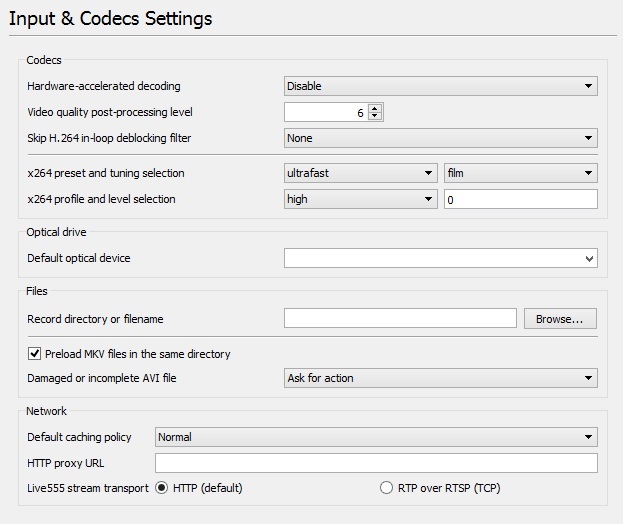 choose Hardware-accelerated decoding to DXVA 2.0. If this will cause more issues, revert to Disable, or automatic. Try using Vidcoder or Handbrake for your encoding as an alternative. The former is based off the latter, and they're GUIs for x264/x265 encoders. They're simpler to use, but still display most of the advanced preferences from the command-line version, if desired. Check MPC-HC, MPC-BE or another fork out. These I've had the least issues with when it comes to hardware decoding the video. While the video is playing, press CTRL+J. This will display some statistics which would allow you to judge whether it's CPU or GPU bound. In MPC-BE it's also a way to determine if it's using software or hardware decoding. Also while playing back the video, go to Play menu, Filters, MPC Video Decoder, and check if changing the settings would help. Not the answer you're looking for? Browse other questions tagged ffmpeg h.264 bitrate or ask your own question.